Where to even begin? England was gorgeous, although rainy, and the time went by so fast. Aside from the research, I saw some fabulous medieval castles and churches, Virginia Woolf’s house, many historical sites that are somewhat of a blur, Standen, a perfectly preserved Philip Webb Arts and Crafts house, the city of Oxford, and so much lovely countryside. 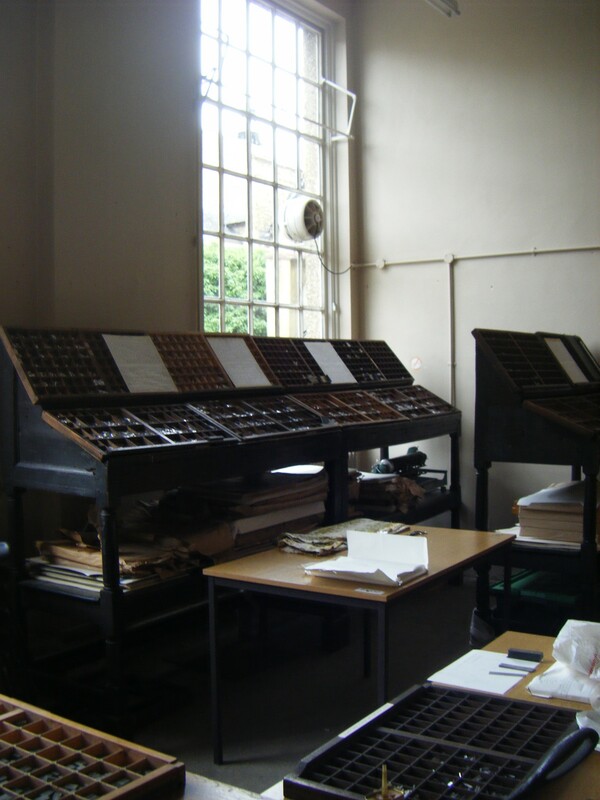 When I did focus on the research, my first stop took me to the Centre for Fine Print Research in the city of Bristol. There I met with researcher/professor/artist Sarah Bodman, whose professional and personal interest in fine presses was invaluable. She is a firm believer in the physical book, and it was neat to hear her perspective on my generation’s interest in fine presses and books, especially in comparison with my own observations of the US. 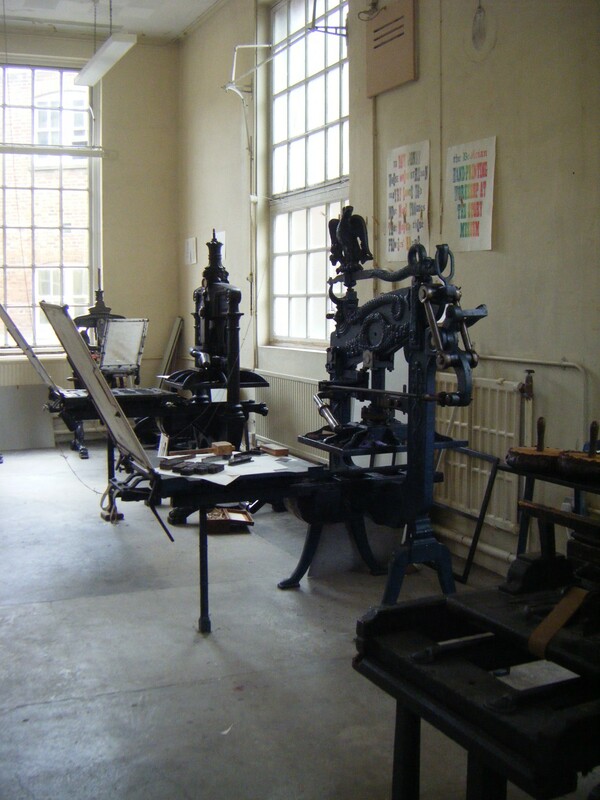 After Bristol, I had the chance to visit Dennis Hall of the Inky Parrot Press and Paul Nash of the Strawberry Press. Both of these were great examples of English fine presses. Paul Nash’s personal library of fine press books is staggering, and after having the freedom to look through it at random, I felt like I hardly even needed to go to a museum to see fine press books! 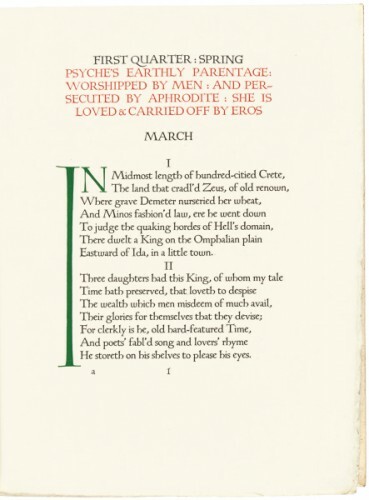 He let me peruse his modest collection of Kelmscott, Doves, and Ashendene Press ephemera, and I could have spent weeks browsing the shelves of his library. I discovered a new favorite press on his shelves: Loyd Haberly’s Seven Acres Press. 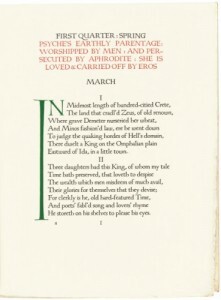 In the style of the Doves Press, many of his books are characterized by the first letter of the page extending down the whole side of the page, like this: But his books are unique in their bold reds and green and blues. 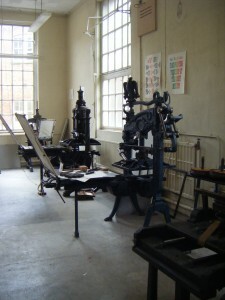 I also saw impressive examples of the Corvinus Press, run by an English Viscount in the 30s and 40s. 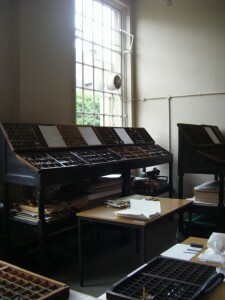 In Oxford, Paul Nash runs the Bodleian Library’s printing workshops, and his knowledge of the history of each printing press and set of type there is overwhelming. I had the chance to see the workshop and some of the pieces that come out of it. Finally, I braved the tube in London and went to the Victoria & Albert Museum, which, aside from vast art and design collections, holds the National Art Library, two beautiful rooms reminiscent of the NY Public Library. After registering for a reader ticket, I requested 7 books to look at. I tried to find the most modern fine press books the library had, because the majority of the books I had seen so far in England were not from the last few decades, so I was interested to see a little of how English fine presses have developed recently. After looking at the chosen examples, I must say I prefer the older books; I didn’t find much that was exciting or innovative in the newest examples. I also roamed through the V&A to see a few medieval manuscripts on display, which were fascinating. England was wonderful overall, and I can’t wait to go back in just a few months for studying abroad at Oxford! This entry was posted in Elisabeth Schyberg '14 and tagged book arts, England, fine press, summer research. Bookmark the permalink.